In the not so distant future...<br />The U.S. has spent several years embroiled in a conflict with the invading forces of China. In the war zone of the American Southwest, small bands of freedom fighters have formed to help guide refugees away from the destruction. Isabel Vasquez, known to her squad as Delphi, has been leading rescue missions inside the combat zone for years. Escorting those displaced from the war has fueled her faith that she is making a difference. But now that faith is increasingly tested by reoccurring nightmares of a coming apocalypse. She fears the war is only the beginning of a great threat...one that promises to bring humanity to the brink of extinction!<br />Unbeknownst to Delphi, a band of renegade angels has fled Heaven seeking a new refuge. The Earth has become their new home, where they view humanity as a plague that must be purged. 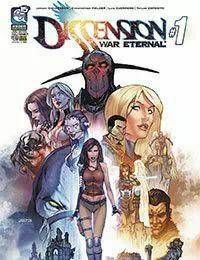 As their path forges ahead toward global genocide, it is yet to be decided if Delphi and her growing visions of a global Armageddon can help stop them in time.<br />From artist and creator Jordan Gunderson comes Aspens most thrilling new series of the summer, DISSENSION: WAR ETERNAL!